Anyone who desires to become an off-grid homesteader must first understand the government’s laws about “nuisance abatement.” The legality of travel-trailer homesteading is now up for grabs, considering that it might very well be an activity that is regulated and licensed by the government. As a cautionary tale, it would be a good investment of your time to know what happened to the San Luis Valley (SLV) homesteaders in Colorado during late 2015. This story begins, as most do involving the American police state, with impromptu visits by the Costilla County deputy sheriffs, who alongside code enforcement personnel, handed out citation tickets for alleged violations of the Land Use Code. These violations ranged from having an expired camping permit to not having an installed septic system. According to the grievances of the SLV off-grid homesteaders, the actions of the county government were intended to run them off their own land. Hyrum Jensen, an Afghanistan War veteran, described how the deputies would place their hands on their guns while they were on his property. Penny Taylor said that due to four years worth of litigation with her neighbor, she faces six months incarceration if she does not quickly remove all building structures from her own land in time for the government’s inspectors. Vince Edwards advocated for secession from Costilla, and he also volunteered to be a pro bono “constitutional” sheriff for this new county. Chloe Everhart, who is Jensen’s wife, tearfully advocated for civil disobedience given the severity of being forced by the government to become homeless. Neale Taylor, who is Penny’s husband, said less than a hour following his arrest on September 15th that if any of the SLV homesteaders did anything to injure any law enforcement officers, he would be charged with a felony. Manny Felui claimed that sheriff’s deputies were enforcing proposed additions to the Land Use Code before they had been adopted by the Costilla County Board of Commissioners (CCBC). John Spounias admitted that travel-trailer homesteading didn’t work out with his family, so he moved to an apartment in Antonito while he builds his house. Keith Jones stated that the undersheriff attempted to turn him into an informant against the SLV homesteaders. Darrell Carter said that his buildings had not been grandfathered in, and as a result, he is being persecuted by the county government. For those unfamiliar with parliamentary procedure, a quorum is the number of members that must be present for the legal transaction of business. Right off the bat, this means that everybody who bothered to show up will not bear witness to any decisions whatsoever being made by the commission regarding the Land Use Code simply due to the fact that the other commission members failed to show up themselves. As a concession, what commission members did show up allowed the attendees who signed up for public comment to go ahead and speak their mind. Penny Taylor’s litigious neighbor, Tim Leggett, supported the changes to the Land Use Code due to a variety of reasons concerning safety, aesthetics, and the “squalor conditions” the children of the newer residents were allegedly experiencing. Penny went next, explicating in front of the packed room nearly all of her grievances against Leggett, which was followed by Jenson expressing his dissatisfaction with the camping permits. During Jenson’s floor time, there was a commotion that one of the police officers made a phone call, which is ostensibly not allowed during a commission meeting. Alex Ansary was subsequently ordered during this commotion to shut off the visual portion of his camera, but he was thankfully allowed to keep the audio recorder going (the commotion had died down by this point). After Carter had his say, Ansary announced the formation of the SLV “Just Us” group as a way to organize the off-grid homesteaders so as to draw media attention in order to increase government transparency; this was done in the hope of having their property rights actually respected by the county government. At least half a dozen other homesteaders had their time on the floor, and nobodysupported Tim Leggett’s advocacy in favor of changing the Land Use Code. Isn’t that awfully convenient? Why bother allowing public comment if any such comments are ex parte, anyway? As can be expected, people commented regardless of what Burns had just announced. At the next CCBC meeting on October 6th, Chloe Everhart presented before the county commissioners a proposal for SLV Just Us to contribute volunteers in order to clean up the public spaces; this is ironic because Everhart was cited just the day before for violating two provisions of the Land Use Code against using a recreational vehicle (RV) as a dwelling. Apparently, she was attempting to counteract any negative impressions against off-grid homesteaders through her grassroots lobbying. Obviously, her idea never took off, primarily due to the upcoming breakup of SLV Just Us. So, for the second meeting in a row, the Planning Commission failed to achieve a quorum. How are there going to be changes to the Land Use Code if the CCBC is waiting for recommendations from the Planning Commission that are not forthcoming simply due to the fact that those commission members fail to show up to their own meetings? It’s also quite inconsiderate, to say the least, to announce a government meeting open to public attendance, and then fail to actually conduct the business of government during that meeting; I guess CCBC chairman Burns’ statement about there being public comments allowed at the next Planning Commission meeting was just lip service if that meeting ended up being canceled anyway. Throughout all of this, two articles by Nathaniel Minor of Colorado Public Radio in both September and October revealed something resembling the Costilla County government’s actual position. Matt Valdez, the land use administrator, said the existing code allowed his office the discretion to deny camping permits already; this denial for the issuance of permits was in force as early as the same day as the September 15th meeting, on the direct orders of both the county attorney and the CCBC. Following the September meetings, Ben Doon, the Costilla County Chief Administrative Officer, thought any proposals to changing the Land Use Code had become a distraction, largely in part due to what Valdez had mentioned earlier. Later on October 20th, Manny Felui and Robin Rutan spoke before the CCBC. Felui pleaded with the board to allow the off-grid homesteaders to continue staying on their land in their RVs throughout the winter so they don’t end up in a homeless shelter. Rutan asked for fair treatment in the sense that if the Planning Commission does not believe everything that is said about the off-grid homesteaders, then the homesteaders won’t believe everything that is said about the Hispanic locals within the Town of San Luis, especially in light of the fact that her husband is a full-blooded Navajo. In other words, the actions taken by SLV Just Us in dealing with the Costilla County government had been utterly in vain, not only because the CCBC deferred to a Planning Commission that twice failed to achieve a quorum, but also because such legislative functions were superfluous given that the CCBC and the county attorney had alreadyordered the bureaucrats to deny camping permits under the current Land Use Code. Given that the code violations were a specific consequence of not having the camping permit, I think SLV Just Us would’ve potentially had grounds to sue the government, especially considering the extenuating circumstances of them homesteading the land; unfortunately, they didn’t pursue that, probably in light of the court costs involved. Not only was there an appeal to white devil imagery here, but also racial supremacy against Akeem, who is racially black. Obviously, the lowest common denominator here is collectivism, as evidenced by this unidentified Hispanic farmer asserting that Akeem, as an off-grid homesteader, is somehow responsible for what water others may, or may not, have been pilfering. Granted, although not as racist as the farmer, this woman probably fits the bill for classism, especially with the pig reference. Again, I think collectivism is present here as well, particularly when she assumed that Ansary was an Arabic foreigner despite the fact that he is a natively born American, much like myself. Shortly thereafter, Neale Taylor was arrested for inciting a riot, and was subsequently told that if any harm came to any police officers or deputy sheriffs, he would be charged with a felony. This really does beg the question as to whether this was a reprisal for SLV Just Us being publicly outspoken at the earlier meeting on September 9th, or if the deputies’ actions were to avoid mob violence in downtown San Luis between the prejudiced locals and the off-grid homesteaders – even if the latter were the case, then why wasn’t the racist farmer arrested for inciting a riot, too? Three days later, Maria Martinez of La Sierra wrote an editorial, disguised as a news story, about how awful SLV Just Us was for expressing their grievances against the Costilla County government. She quoted herself during the ex parte public comments made during the CCBC meeting on the 15th, which is not standard journalistic practice, even for the mainstream media. The rest of her shoddy article is filled with grammatical errors and factual inaccuracies; it’s almost as if La Sierra didn’t have an English-language editor on staff to proofread Martinez’s “article” before it went to press. This is one more reason why the alternative media is growing in popularity, as exemplified here by Alex Ansary’s footage. Notice the connotation of Caucasians being oxymoronic “sovereign citizens” here, as well as the additional guilt by association with anyone else homesteading off-grid. I especially enjoyed how Dr. Peña claimed that the county’s laws were “legitimate” and “long fought for,” as if that was valid justification for violating argumentation ethics. This was repeated in Spanish, and showed three enlarged pictures of what illegal dumping looks like. So, the Costilla County government knew about these illegal dumping sites outside San Luis; did the Latina just assume that the other locals of San Luis were not themselves participating in this dumping? Was SLV Just Us simply a convenient scapegoat for what some of these bigoted Hispanics were themselves doing? Who is really “living like pigs,” here? It would seem that Dr. Peña expected Everhart to make the 40+ mile roundtrip to San Luis just to schmooze with the Hispanic locals on the one hand, all the while attempting to fend off the county government with the other single-handedly (not to mix metaphors). I doubt Everhart would’ve gotten any help from Dr. Peña or his cohorts even if she had schmoozed with them, especially in light of Dr. Peña’s earlier professed support for the county’s laws. Doublespeak, much? Ansary took offense at this second sign, and proceeded to engage in dialogue with Espinoza and his growing crowd of sycophants. Despite Ansary’s good role-modeling of interpersonal diplomacy, Espinoza’s mob only grew in numbers and virulence. Finally, the undersheriff ordered the courtyard to be cleared, going so far as to tell Ansary that he would be forcibly removed if he didn’t get into a car immediately. While leaving, footage was captured of the Colorado State Patrol nearby, given their light blue shirts and tan black-striped pants that comprises their uniform. En route leaving San Luis, Sam, another homesteader, remarked thathe didn’t think this controversy wasn’t about land use issues anymore, but rather about social stratification, as evidenced by the two protest signs. Later that day at John Spounias’ property, Spounias told Ansary that a few of the San Luis townsfolk informed him in the courtyard that back in the 1960s they were able to run hippies out of town with .30-06s, and they’d do it again to the off-grid homesteaders if they could get away with it. So, Akeem (a black man) and Ansary (who is of mixed Caucasian/Afghan lineage) were racially discriminated against by two different unidentified Hispanics, which was followed shortly thereafter by Neale Taylor’s arbitrary arrest and release, all of which occurred on September 15th. On the 18th and 23rd, Martinez and Dr. Peña, respectively, wrote articles demonizing the homesteaders. September 24th revealed footage suggesting that it was the locals of San Luis who “lived like pigs,” not the homesteaders, because of the illegal dumping within a few miles of town that the county government was very well aware of; then, on October 13th, Dr. Peña wrote a rather libelous article further demonizing SLV Just Us, and this precipitated the former county sheriff provocateuring the off-grid homesteaders into a shouting match the very next day. Amongst all this blatant prejudice, none of those Hispanic bigots were harassed by the sheriff’s deputies. It was Manny Felui who got shoved down the street by a police officer on September 15th, it was Taylor who was arrested that same day, and it was Ansary who was threatened with forcible removal on October 14th. None of those Hispanics in San Luis who threatened Spounias with being run out of town by a mob armed with .30-06 rifles were threatened with forcible removal, shoved, or arrested by the undersheriff or any of his deputies. If anything, the police were all too eager to act under color of law against the off-grid homesteaders, which is how this whole mess got started in the first place, as described by Hyrum Jensen. Harassed on two fronts by the county government and the prejudiced Hispanics within San Luis alike, the off-grid homesteaders became ripe for whatever assistance that would be offered by nearly anybody from outside Costilla County. Desperation breeds strange bedfellows, and SLV Just Us was no exception. It was their acceptance of the resurrected Operation Patriot Rally Point (OPRP) that was the beginning of their demise. What was OPRP in the first place? Rodger Marsh founded OPRP in 2013 originally as a proposal for crowdfunding three constitutionalists to travel across the nation collecting signatures for thirteen petitions that were to be hand delivered to the congresscritters in the District of Criminals. Less than a $1,000 was collected, and so the cross-country trip was abandoned. Three months after Marsh’s last vlog pleading for donations, the RV he refurbished for that nationwide road trip was instead repurposed for moving his family; en route, it caught on fire. Unsuccessfully, he established a recovery fund that collected less than $200 since all of their possessions literally went up in smoke. Approximately two and a half years following the burning of that RV, Marsh shows up on October 6th (right after a CCBC meeting), claiming that he owned seven acres of land “up in the mountains.” Marsh also claimed that he had served 18 years in the U.S. Army, and that he was a former Army Ranger. He went on to invoke the events of Bundy Ranch as something to be avoided, which roused the crowd of homesteaders. A decision was made to hold a meeting at the Fort Garland Community Center. Two days later, SLV Just Us and OPRP held that meeting in nearby Fort Garland. Expounding upon his primary claim from the earlier gathering, Marsh asserted that there was a judge who was interested in the plight of SLV Just Us, and who was also considering arriving in Costilla County with U.S. Marshals in order to handle the presumed corruption within the county government. Near the end of this meeting, Marsh whipped out his cell phone in order to put this judge on speakerphone, so as to schedule another meeting that the judge would attend so he could personally meet with the off-grid homesteaders. October 16th was the day of the “Meet the Judge” event near Lobato Bridge, which Alex Ansary predicted was not legit and, more likely than not, a setup. During this event, Marsh ordered that there will be no videotaping, and in response, Ansary directly confronted Marsh. This resulted in Ansary and a few of the other homesteaders getting pushed out of the house where the event was being held. Vince Edwards attempted to keep the peace by telling Ansary that the property owner will not tolerate anyone yelling, and Ansary replied by saying that SLV Just Us does not need his help anymore; so, as a result of Marsh’s authoritarianism, Ansary chose to leave Costilla County. Four days later, Rodger Marsh was arrested without incident at the Grizzly Inn in Alamosa by Colorado State Patrol and Alamosa Police Department officers on three outstanding warrants – one from Tarrant County, Texas for violating probation, another from Franklin County, Indiana for child neglect, and a third from Cassia County, Idaho for a DUI, according to the Valley Courier. John Spounias, Robin Rutan, and Hyrum Jensen are now on the record specifically rebuking OPRP, especially given that Chloe Everhart found that the alleged judge, Bruce Doucette, was simply a member of a “sovereign citizen” group, and therefore had no legal credentials at all. During the recent statist turf war up in Oregon, a “People’s Grand Jury” issued a write of mandamus on January 8thof 2016 “indicting” at least half a dozen Costilla County government agents of “feloniously embezzling public funds.” Four days later, The Oregonian reported that Bruce Doucette convened a similar “citizens’ grand jury” in Harney County in order to examine proof that the federal government committed crimes of some nature involving the Malheur National Wildlife Refuge, going so far as to promise a written decision by this ad hoc grand jury in writing, which thus far, has been unforthcoming. This is a rather interesting point, especially considering that Marsh had neglected to mention that he was a veteran back in 2013, so it is entirely possible that he had stolen valor when he claimed to be a former Army Ranger. Marsh’s integrity is also brought into question by the fact that he was arrested at the Grizzly Inn, as opposed to what he claimed were his seven acres of property “up in the mountains.” Anyone who bothered to just read Doucette’s “oath of office” as a “superior court judge” of “The Continental uNited States of America” could easily tell that he is nothing other than a sovereign citizen douche-bag. Given all these exacerbating circumstances, it’s all too easy to lose sight of why the Costilla County deputy sheriffs were at Hyrum Jensen’s property with their hands on their guns in the first place. From what I can piece together, it would appear that the county government’s position here is that they were enforcing nuisance abatement.Homesteaders in the rural California desert in 2014 have experienced the heavy-handedness of local governmentthrough this form of central planning. This is what Chloe Everhart and Manny Felui were relying on, so I think it is obvious to see that what they had attempted to do here is exploit a loophole. Unfortunately for them, this was an unstable loophole, given that the permit could be denied or otherwise rescinded; in other words, they knew ahead of time that the rug could be pulled out from under them at any time, yet, they decided to gamble on the likelihood that it wouldn’t happen. Simply put, the off-grid homesteaders lost on their bet primarily due to the fact that the Costilla County bureaucrats saw how the camping permits were “abused” by being renewed every quarter, since these permits had been intended as a temporary measure, not one where they could be renewed indefinitely, so long as the permit fee was paid. So, the Colorado General Assembly passed some laws that delegated enumerated powers to Colorado’s 64 county governments in order to compel the removal of rubbish, weeds, brush, and any structures that presented a substantial danger or hazard to the public welfare. There might be a potential statutory challenge here as to whether an RV that is used as a permanent dwelling constitutes a substantial danger or hazard to the public welfare, but I would venture a guess that despite the best possible litigation strategy, the deck would be heavily stacked in favor of the State. Probably a better way of explaining it is how the Colorado Revised Statutes cannot supersede the Colorado Constitution, but Spounias’ point is well taken regarding the hierarchy of law. It could potentially be worth it for Art. II §§ 3 & 7 to be printed on custom aluminum warning signage, but the only case law I am aware of that shows this to be effective was the 2014 Mundy v. Indiana case, which of course pertains only to Indiana, not Colorado. Ultimately, I think that Carter and Spounias’ arguments put together just might have a solid constitutional case against nuisance abatement, but it would have to be litigated in the government’s own courts in order for a precedent to be set, and as Alex Ansary mentioned on February 26th of this year, higher courts have not stepped in. For now, what this appears to mean is that the Costilla County government retains the legal ability to centrally plan the development of residentially zoned areas, and therefore, the act of travel-trailer homesteading, whether or not the owners are constructing a more permanent home, is legally prohibitive. This “victimless crime” of living on land an individual owns, building structures as he goes whenever he can afford it, seems to be way too muchspontaneous order for the local Costilla County bureaucrats to handle. Can you imagine 19th century American pioneers being tolerant of this governmental beneficence? There are many lessons to be learned from this escapade in Costilla County. I’d say the first is that when you are being legally opportunistic, it is preferable to rely on stable loopholes to exploit rather than unstable ones, but if you decide to go ahead and gamble on an unstable loophole, then don’t come crying to anyone by expressing petty grievances when you end up losing on your bet that you voluntarily undertook. Revealingly, Spounias admitted that travel-trailer homesteading didn’t work out for him, which is why he is living in an apartment in Antonito while he builds his home in Costilla, so this workaround does not put him under the thumb of being homeless, whether it be due to the lack of a camping permit or a septic system. Secondly, reformism does not work. I hate to beat this horse to death yet again, but I would be remiss in my duty of being intellectually honest if I were to ignore the actions of Manny Felui, Robin Rutan, and especially Chloe Everhart in grassroots lobbying. Oddly enough, suing the government might actually have been marginally helpful here, but that avenue was not pursued, to my knowledge. Everhart’s one time mention of civil disobediencesmacks of brazenly “teasing the bear,” much like the membership of Free Keene up in New Hampshire with their 420 celebrations; even so, civilly disobeying the government here would likely have been very much akin to the example set by the Citizens for Constitutional Freedom up in Oregon who mixed all of their reformism with civil disobedience, which is quite problematic, to say the least. Begging the State for favors all the while brazenly disobeying their laws does not make for good strategy. Thirdly, vetting individuals is not a sin or a hallmark of paranoia, but rather, a healthy indication of good security culture. 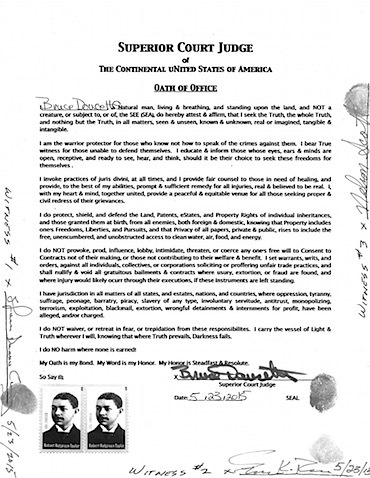 Bruce Doucette himself specifically encouraged SLV Just Us to verify his “credentials” during the Fort Garland meeting, so that by the time the “Meet the Judge” event occurred, it would have been presumed by him that everybody attending would already know that he was a “sovereign citizen,” and everything that it would mean. It was because this vetting was not done by SLV Just Us that the group was finally broken up, something both the county government and the Hispanic bigots had failed to pull off themselves. Fourthly, watch out for the lack of transparency. It is one thing to be a privacy advocate, but it is another matter altogether when public meetings are not being recorded, just as if they were an elaborated version of the minutes. Whether it be the Planning Commission on September 9th or the “Meet the Judge” event on October 16th, anytime someone running a public meeting tells you to stop recording, then it’s high time to raise a hue and a cry about it, because without that transparency, corruption breeds. Again, private conversations ought to remain private, but apublic meeting is aboveboard and therefore subject to reporting and commentary by the free press as well as the public at-large. In summary, I think SLV Just Us had their dissent chilled because they were besieged from all sides. Their back was broken not by their clearly identifiable opponents, but rather, by those who portrayed themselves as fellow comrades. If any one lesson were to be learned from this saga, it would be that “activist” groups are highly overrated in their efficacy for securing individual liberty.